A few years ago my wife asked me to go to Laos and Thailand. There was no particular reason, she just decided she wanted to go. I was busy at work and agreed to go somewhere the following year. So she went without me. 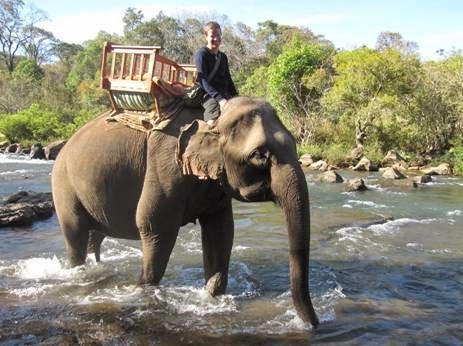 She spent three weeks wandering the villages, seeing temples and riding an elephant across a stream. She sent pictures and in between customer calls I tracked her adventures via GPS. It looked amazing! The following year I was still too busy. Something, which I can't remember now, was really important and I needed to be at work. It was an excuse. She learned Russian, traveled to Ukraine, ran the 93 mile Wonderland Trail around Mount Rainer, and got her pilot's license. Just because. My wife is an inspiration to me (pause for eye rolls). What inspires me is not only the amazing things she does, but that she just does them. No excuses. No "I'm too busy". No "maybe next week" or next month or next year. She just decides what she wants and goes about getting it. I was thinking about career development and elephants this morning. And just becoming who we aspire to be. It is easy to think of development as an event. As something big. As something that happens to you. It is easy to procrastinate. To put it off. To be too busy. To tell yourself, "I will… next week." To believe, "I'll have more time when…" And then time slips away. The reality is that development is something that you just do. No excuses. Development opportunities are all around us. Simple, easy things like leading a meeting or asking what you could do better, reading before you log in each morning and sharing the insights with your peers, writing that blog you keep putting off, Tweeting something insightful to build your voice, pausing in your everyday work to think to yourself, how can I use this as a development opportunity? It is up to each of you to raise your game, raise your hand and just make it happen. Today. Not later. A development culture doesn't just happen. We make it happen! What have you done this week to develop yourself?